I got a problem here, I create the relay board that consists of 34 coil relays (5V DC). I use AT90S2313, 74HC595, and ULN2803. Everything is running well until I connected the relays to AC line as switcher to light bulb. Everytime I switch on the relay (lamp) my relay board got error. what is the error..what kind of error?? One more thing, when I switch the relay with no AC load it works fine. I think the 74HC595 IC is a sensitive one. Does anyone have some tips to reduce the sensitivity? or solves the problem? Do you have diodes on the relays for the BACK EMF that occurs? inductance when Q1 turns off. 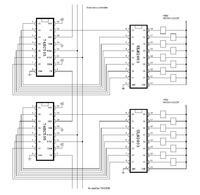 I use ULN2803 which is Darlington Array. I think it has diode to protect from inductance (CMIIW). Do I stiil need that diode? This noise occurs when the relay goes closed (on) with AC loads. As I know, that relay's coil inductance occurs when the relay goes off, am I right? And like I said before, all relays work fine, without AC loads. even it works ok when i used DC load (small DC light bulb). what is the max rating of the relay contacts V/A? could you post the schematics,if you have readily. sort of reseting the controller. So when i try to light on the bulb (AC load) at the first relay, my relay board is becoming randomly switch on the relays (for example, it would be 2nd, 5th relay are on). But if i unplug the AC load from the relays, whole things are running well, I mean, i can switch on-off all the relays that I want to. this seems to be a ground problem. have you provided decoupling capacitors close to all the Vcc pin of all the ICs.Preferably a MLC capacitor?? as you said, i used capacitor (plastic one, because i dun have any MLC) close to 74hc595. the problem still occured. until i separated the power supply for IC and relay board (i used 2 power supplies). so using capacitors and separated power supplies is the best way to solving my problem (for now).. so the next question is how to make this board, to use single power supply only..
i will try to use MLC capacitor soon. also try a couple of 10k pull-ups on the serial data and clock to the 74hc595. You may be coupling in some interference from the AC. Even before the PIC starts. I had a very similar problem, (when someone touched the board) but I was using the higher current TPIC6C595 to directly drive my relays. I have the same project. Use the CLR impuls before write data for all 595.
tiny13 + 74hct595 + BCR533 for relays parallel with 1N4148. thx treitmey for your response, but i'm a newbie.. i don't know how to do that. could you explain me where to put the 10k resistor (did you mean to put 10K to across vcc and clock?) or what? and on every IC or latest IC? please help.. thx in advance..
what is CLR impuls? Did you have same problem like me? SOLVED!! i put 100nF caps for decoupling all ICs. and put 1uF at latch pin. my problem seems to be solved..
First, I apologize for bring this thread back -- however, I have the same issue. 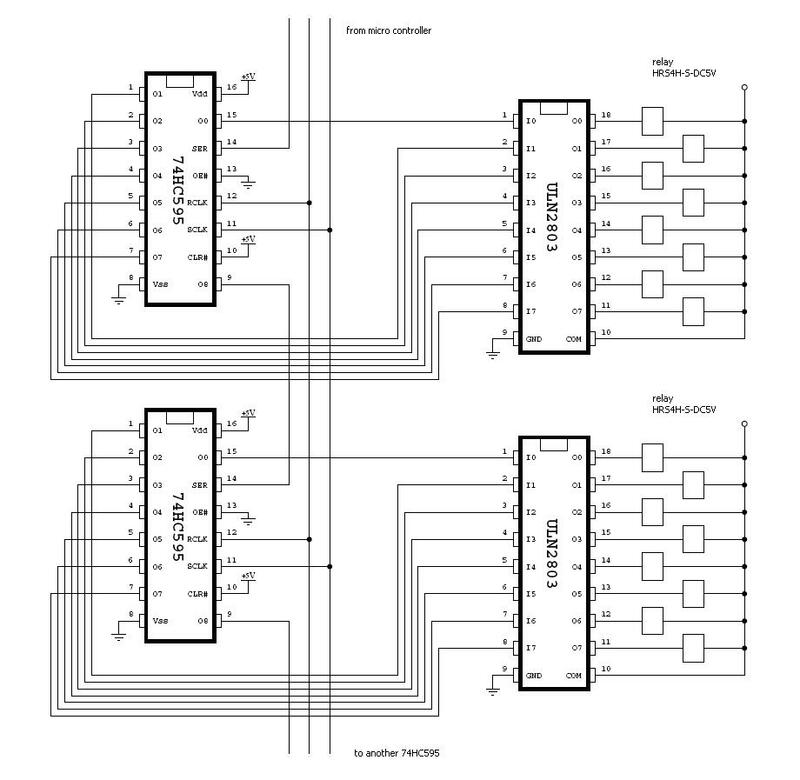 Where exactly did you place the 100nF and the 1uF caps on your schematic? Thank you in advance for any help you can provide, as I am a noob.